» New Ride - Stilts! Happy to report that the ride out on the CBX1000 went well , had a good day I liked the CBX not a bike I would go out and buy but nice all the same , being a six after the Pan it sounds to be revving it's nuts off and you find yourself going for another gear all the time , think it would benefit from a louder can ( muffler I think you call them ) on it , it did have a six in to one when our lad bought it and I think our Col the brother that has it now still has it somewhere but he prefers it to be as standard as he can , the engine looks wide as you walk up to it but just like BMW R's with the heads sticking out once you get on it and pull away you forget all about it and just get on with enjoying the ride , one thing for sure it is a head turner , we went to Whitby to a biker meeting place and sat having a cuppa and the amount of people that stopped to have a look at it and take pictures was endless and we had competition for there was a 1919 Brough Superior bought new by the riders great grandfather and has been in the family from new and was raced in the IOM TT by the guy that bought it , I remember seeing it at the 2007 centenary TT the last time it was over there . Always liked that 6. I'm sure Honda built it just to stick in the face of all the other manufacturers. One of my friends had the Kawasaki version and it IS wide! There is a pre-warm-up tomorrow in town for a ride this fall. I'd go, but the KLR has absolutely bald tires (on order), and there will be swarms of Harleys there so it is of little interest for sight-seeing. 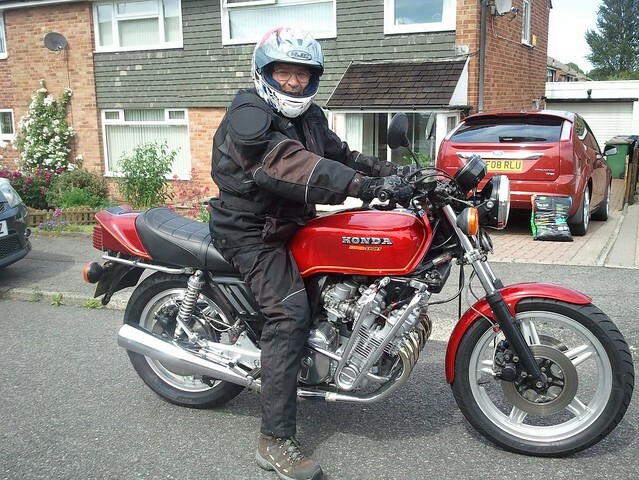 My Dad had a beautiful CBX for many years. He sold it reluctantly, because he had collected too many bikes, and it wasn't getting ridden enough. They are very complex and finicky, so more of a problem sitting than most. It is really two three cylinder engines on a common crankcase. Dad, being the mechanical type, really enjoyed learning and fiddling with it. It had 6 into 6 and 6 into one pipes at various times. I got to ride it a few times and was impressed with the seamless power and rapid starting (just think about touching the starter button and it was running). Less impressed with the (rubber mounted?) bars and weakish brakes (even though Dad had worked on improving them). 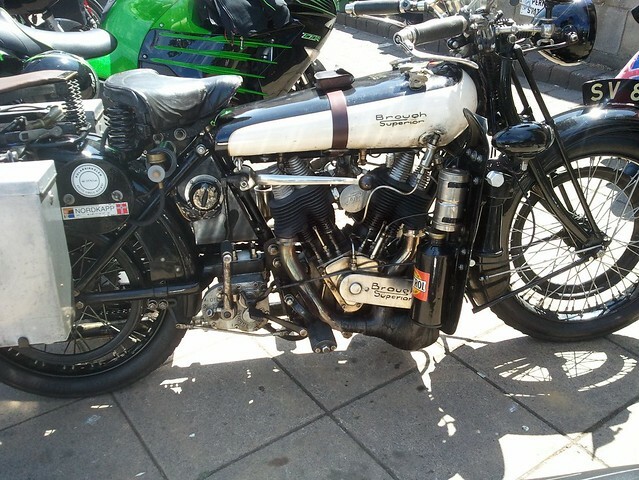 Yeah, I commonly see one-family-owner Brough Superior's at the local ride-out! You "should" be safe reading anything here, as long as you don't click on any links or such in the text. But, no reason not to stay clear of it either. Still working on getting the house set up (have to fit it in amongst work and other chores). Looking forward to fiddling around with bikes again (someday).